Philosophical esotericism--the practice of communicating one's unorthodox thoughts "between the lines"--was a common practice until the end of the eighteenth century. The famous Encyclopédie of Diderot, for instance, not only discusses this practice in over twenty different articles, but admits to employing it itself. The history of Western thought contains hundreds of such statements by major philosophers testifying to the use of esoteric writing in their own work or others'. Despite this long and well-documented history, however, esotericism is often dismissed today as a rare occurrence. But by ignoring esotericism, we risk cutting ourselves off from a full understanding of Western philosophical thought. Arthur M. Melzer serves as our deeply knowledgeable guide in this capacious and engaging history of philosophical esotericism. Walking readers through both an ancient (Plato) and a modern (Machiavelli) esoteric work, he explains what esotericism is--and is not. It relies not on secret codes, but simply on a more intensive use of familiar rhetorical techniques like metaphor, irony, and insinuation. Melzer explores the various motives that led thinkers in different times and places to engage in this strange practice, while also exploring the motives that lead more recent thinkers not only to dislike and avoid this practice but to deny its very existence. In the book's final section, "A Beginner's Guide to Esoteric Reading," Melzer turns to how we might once again cultivate the long-forgotten art of reading esoteric works. 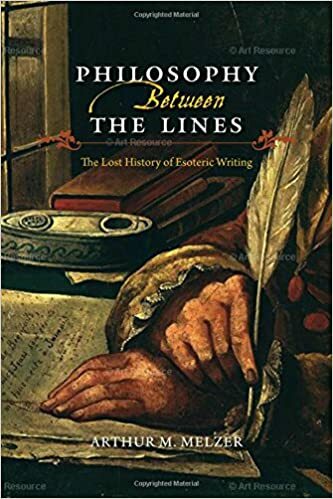 Philosophy Between the Lines is the first comprehensive, book-length study of the history and theoretical basis of philosophical esotericism, and it provides a crucial guide to how many major writings--philosophical, but also theological, political, and literary--were composed prior to the nineteenth century.